The Blue Whale is one of six species in the family Balaenopteridae; it is the largest animal known to have lived and inhabits all oceans of the world. It is a baleen whale, with a wall of black fibrous keratin plates (baleen) hanging on the upper jaw, which is used to filter out food. Also referred to as rorqual whale, it has a pleated throat and ventral grooves that expand to allow large volumes of water and food to be taken when feeding. Pygmy Blue Whale Balaenoptera musculus brevicauda (average length 22 metres) occurring only in the Southern Hemisphere and generally north of the Antarctic convergence (lat. 55o-60oS). Current threats include: noise from marine industries, entanglement in commercial fishing gear, interference in feeding areas, collision with ships, ingestion of pollutants from oil spills & marine debris such as plastics. Other threats, which could impact on the entire population, include potential commercial expansion of the Antarctic and sub-Antarctic krill fishery which could result in more competition for the krill resource and less food available for Blue Whales. Manage the potential impacts of whale watching, ecotourism through the application of Victorian and Commonwealth whale watching regulations. Assess and manage physical disturbance and development activities such as shipping (collision with ships), aquaculture, pollution, recreational boating, and oil & gas exploration and extraction industries – including the application of environmental impact assessment and approvals and the development of industry guidelines and State/Commonwealth government regulations. Three physiographically discrete regions have been identified and described in the above paper. The Western Zone (a relatively wide continental shelf of 60 to 160 km). The Central Zone, which has the narrowest shelf along most of Australia’s southern coast (25 to 80 km) and the Eastern Zone which is intermediate in shelf width (50 to 80 km) (see map). A total of 69 aerial surveys were flown between the 2001/02 season and 2006/07 season. For the Central and Eastern Zones i.e. 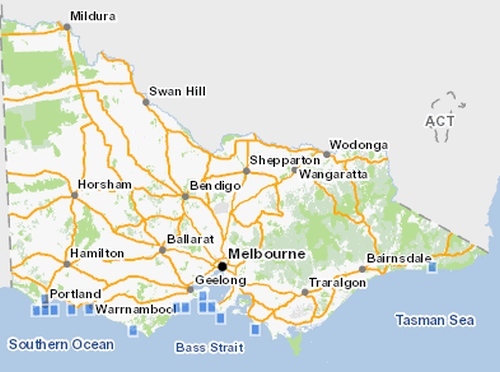 Bonney Upwelling waters off south eastern South Australia and south west Victoria the combined count for each season was 2001/02 (44); 2002/03 (68); 2003/04 (108); 2004/05 (79); 2005/06 (27); 2006/07 (14). 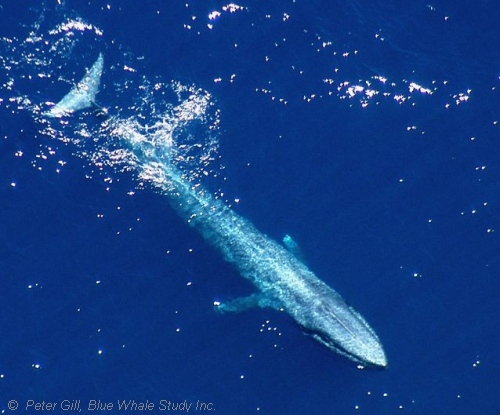 Blue Whales arrive at the Bonney Upwelling by mid November and depart by the end of April. There is a shift in densities between the zones as the season progresses with Blue Whales restricted to the western/central zone in November, entering the eastern zone in December, and widely spread through the central and eastern zones during January, February, March, and April. The two most significant variables explaining Blue Whale distribution were found to be Sea Surface Temperature (increasing probability of sightings with warmer water) and Sea Surface Chlorophyll (increasing probability with higher levels) these variables tend to be related to each other. 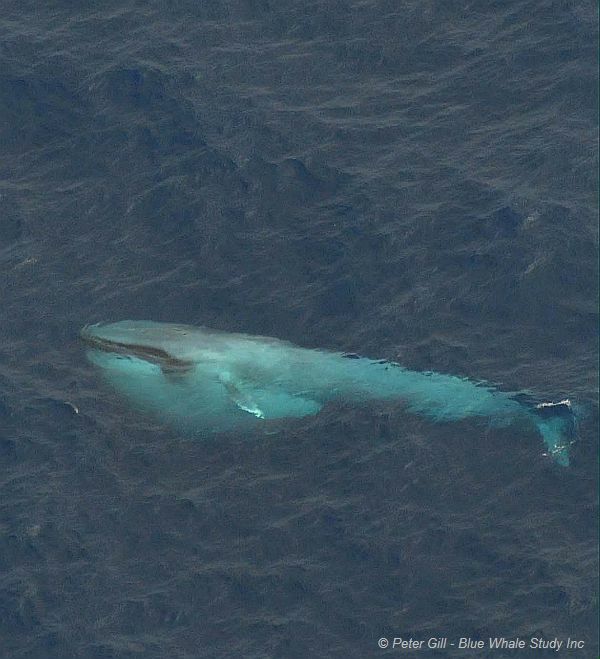 In the central and eastern zones study area combined, 93% of blue whale sightings occurred in depths less than 200 m.
1 Ichihara, T. (1966) The Pygmy Blue Whale, Balaenoptera musculus brevicauda, a new sub-species from the Antarctic. In Whales Dolphins & Porpoises, pp. 79-124, Ed. Norris, K.S., University of California Press, Berkeley and Los Angeles 1966. 2 Kato, H., Miyashita, T., Shimada, H., (1995) Segregation of the Two Sub-species of the Blue Whale in the Southern Hemisphere, RPT. INT. WHAL. COMMN. 45, 273-283, 1995, SC/46/SH10. 4 Sears, R., (2002) Blue Whale Balaenoptera musculus, Encyclopedia of Marine Mammals, Ed. Perrin, W., Wursig, B., Thewissen, J.G.M., Academic Press. 5 Yochem, P.K. & Leatherwood, S. (1985) Blue Whale Balaenoptera musculus (Linnaeus, 1758), Handbook of Marine Mammals Vol. 3, The Sirenians and Baleen Whales, Academic Press (London) Ltd.
7 Thiele, D. (2001) Preliminary report on IWC-SO GLOBEC collaborative research in the Western Antarctic Peninsula Study Area; June 2001. 9 Victorian Biodiversity Atlas, Department of Environment, Land, Water & Planning, Victoria. Accessed: October, 2015.